EZclear Sterile Erlenmeyer Shaker Flasks from Foxx Life Sciences are moulded from clear, leachable-free polycarbonate resin. Fully retaining clarity after gamma sterilization, and complying with stringent FDA and USP requirements. EZclear Erlenmeyer flasks are available as a fully-sterile version, which are additionally certified as non-pyrogenic and DNase/RNase-free. Making them ideal for cell cultures, microbial cultures, plants, media preparation, storage, and all other applications. The non-sterile and sterile shaker flasks fit all standard shaking incubator clamps and can be placed on any platform. 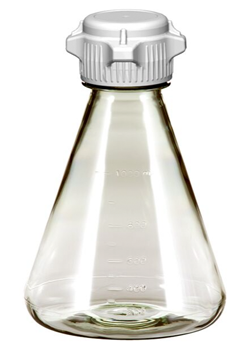 Foxx Life Sciences’ Erlenmeyer Flasks are available with a flat or baffled base for increased oxygenation and mixing. Flasks are compatible with all 53mm VersaCap technology and adapter inserts, enabling easy customization of top connections. 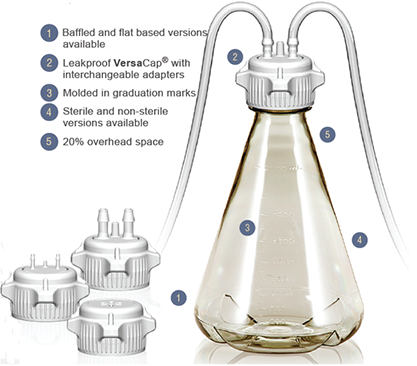 Vented VersaCap with a 0.2µm hydrophobic membrane can be purchased with the unit, or separately as an accessory. All Flasks and VersaCaps are autoclavable at 15 PSI and 121˚C for 20 minutes. To further discuss the Erlenmeyer Flask range, and how we can help you. Please contact us, or request a callback at a convenient time to suit you.